The Pines, sometimes known as The Catskill Pines, serves the kind of brunch you’ll find yourself daydreaming about weeks after eating it. It’s located just 5 minutes away from the Phoenecia Diner, so it’s an easy back-up spot when the diner is crowded with every other weekender looking to #escapebrooklyn. But for us, the Pines is definitely our first choice. We’d traveled directly to Mount Tremper just to try their highly recommended chubby squirrel pastries, but they sold the last one to the person in line in front of us. We were left with the most delicious banana bread (with a molten chocolate core), omelets, and biscuit sandwiches—and no complaints whatsoever. The menu is small, the ingredients farm-fresh. My omelet brought together the sweetest kernels of fresh corn, juicy late-summer tomatoes, creamy hunks of goat cheese, and a sprinkle of crushed black pepper and microgreens. It was served beside the sort of salad that’s perhaps the edible equivalent of rolling around in a field. There’s joy in the lettuce leaves. The breakfast sandwiches promise golden-yolked eggs on rich, buttery, crumbly biscuits. And you’d be hard-pressed to find a better looking slice of bacon. The rustic space, twinkling with string lights that hang from slanted ceiling beams, is exactly the kind of cozy Catskills hideaway you hope to stumble into on a trip upstate. 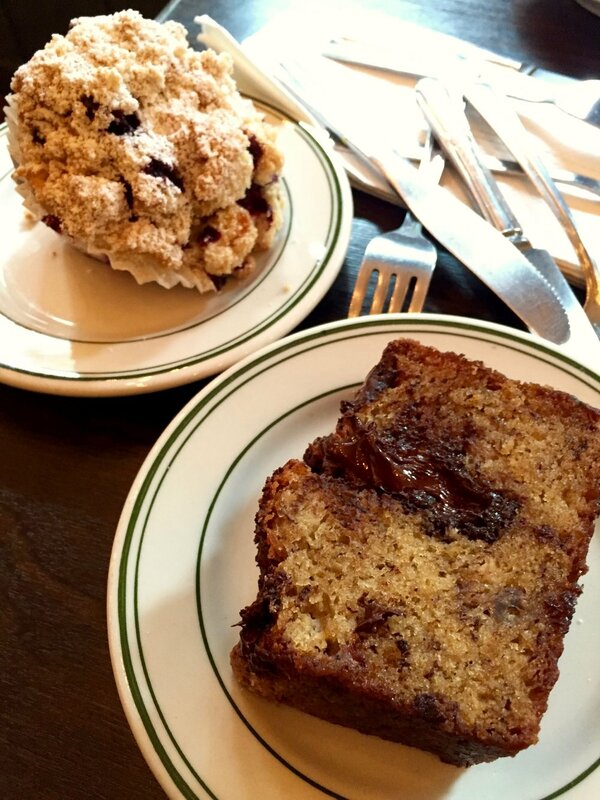 And did we mention the crazy-delicious banana bread, which was served warm with a molten chocolate core? Yeah, it was even better than it looks. So was the crumb-topped muffin. Definitely save room for brunch-dessert. We haven’t experienced the Pines dinner menu yet, but their brunch service involved ordering at the coffee counter, which made the place feel really casual and kid-friendly. Like many of the great little eateries in the Catskills, including amazing Kuhar Family Farms, the Pines doesn’t look like much from the outside. It’s a local favorite, but you’re new to the area, you could drive by a million times and never guess what kind of magic lies within. If you enjoy hidden gems, add this one to your list. The Pines is a restaurant, bar, and lodge located at 5327 Route 212; 845-688-7311. Check our their calendar for upcoming live music events (which are held most weekends), and see their website for their current hours and menus. They don’t take reservations for brunch, but we’d recommend calling ahead for dinner. Oct 13 Hey There, My Little Hot Chicken Biscuit!